Duke Orsino lounges in his palace in Illyria, alternately praising and lamenting the nature of love. First, he asks his attendants to serenade him with music. Then, he makes them stop. Love, he says, like the ocean, consumes whatever is cast into it. He adds that it is so "full of shapes," constantly changing its objects, that it is like a hallucination. Attended by servants, Orsino indulges fully in his melodramatic melancholy, not only staging a musical performance but also using clichéd language to compare his intense feelings to madness. Curio, one of Orsino's attendants, enters and asks the Duke whether he will he come hunt "hart" (male deer). Orsino jokes that, since he first saw Olivia, he himself has been like a hart, hunted by his own desires. Employing the metaphor of a hunt and punning on the words heart/hart, Orsino's love-melancholy seems like a self-conscious performance. Valentine, another attendant, returns from Olivia's palace, where Orsino has sent him. He reports that Olivia is deep in mourning for her brother, who recently passed away. To keep her brother's "dead love" (1.1.31) fresh in her memory, she has vowed to live like a nun, cloistered and weeping, for seven years. Orsino is further impassioned, rather than discouraged, by this news. If Olivia will "pay this debt of love but to a brother" (1.1.34), he exclaims, imagine how intensely she will love when she is filled with (romantic) affections for only one man. Although Olivia's intention to honor "dead love" contrasts with Orsino's passionate desire, Olivia's mourning, like Orsino's love-melancholy, involves self-conscious performance: she takes the role of a nun. Meanwhile, Orsino continues to play the role of a stereotypical lover, growing more impassioned by his beloved's resistance. Weigel, Moira. "Twelfth Night Act 1, scene 1." LitCharts. LitCharts LLC, 22 Jul 2013. Web. 13 Jan 2019. Weigel, Moira. 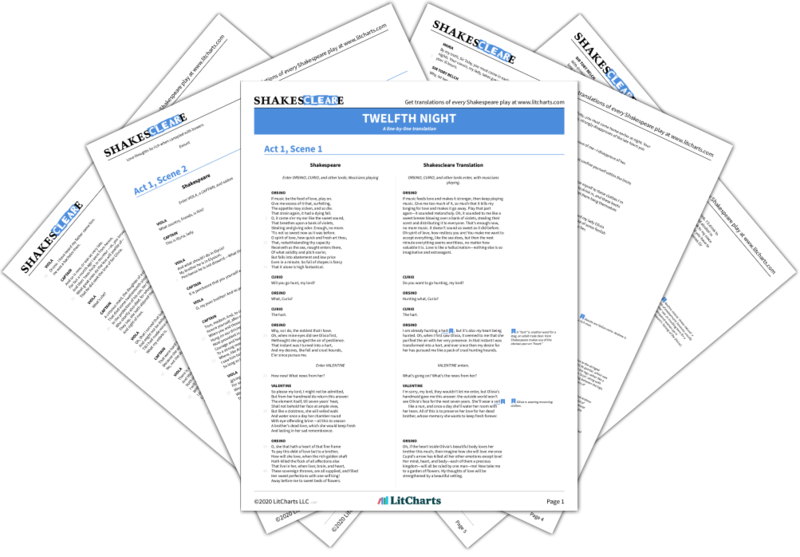 "Twelfth Night Act 1, scene 1." LitCharts LLC, July 22, 2013. 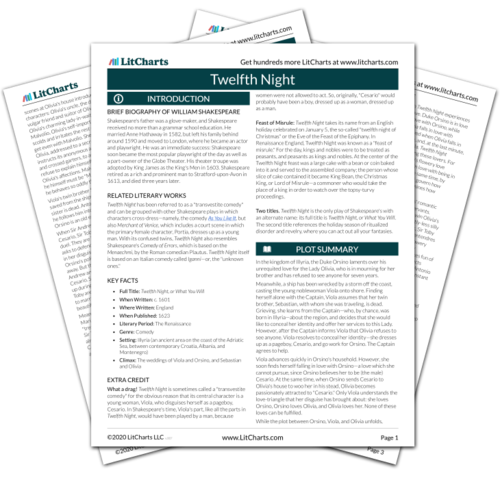 Retrieved January 13, 2019. https://www.litcharts.com/lit/twelfth-night/act-1-scene-1.